The moment has finally arrived: the new spectacular project of the russian artist group Blue Noses will be shown on the 9th of December at the Knoll Gallery Vienna. 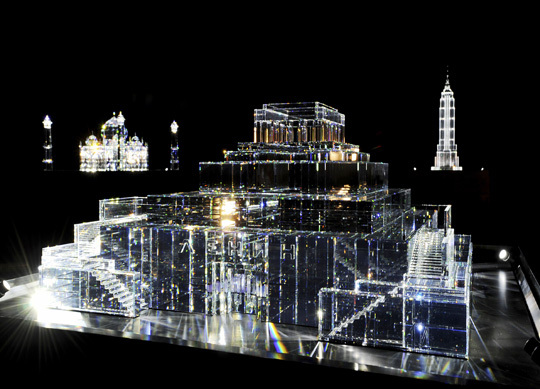 After four years of close collaboration between the Blue Noses, Swarovski and KnollGalleryVienna, four unique architectural objects made of crystal glass with integrated flat screens have been created: The Taj Mahal of Agra, the Empire State Building of New York, the Lenin Mausoleum of Moscow and the Cheops pyramid of Gizeh. The Blue Noses gave these sparkling and culturally charged buildings new inhabitants by means of their well known satirical video works, and these famous inhabitants succumb the same low appetites as everyone. "The artist group “Blue Noses” consists of two artists, both coming from Russia’s province - Viacheslav Mizin, performer and architect from Novosibirsk and Alexander Shaburov, artist and writer from the Sverdlovsk Region (currently known as Ekaterinburg). They came together for collective creative work at the very end of the Yeltsin era - in 1999. At this time Russian culture was going through a state quite unusual for itself – a state of voluntary conformism. It ceased to feel oppositional to the state and society. Sharp political parody had lost its relevance. “Sots Art”, which was the main style of the Soviet art-underground of the 70s and 80s had been using this parody to ridicule the communist visual propaganda. “Enough of mockery and scoffing. Long live the new sincerity!” was the artistic slogan of the moment. Out of solidarity with the tastes of the “New Russians” many artists had turned to academism, Neo-Art Deco and other stylizations. Similarly as it was at the end of the 19th century, into Russian art came a glamorous and frivolous bourgeois eclecticism with its passion for luxurious decoration and its play with the whole spectrum of achievements of international art. Blue Noses were also shouting about sincerity and dreaming about merging in ecstasy with the emerging Russian society. Not with those, however, who at the time were hastily cobbling together unstable capitals and eagerly buying up the properties. Not with those who, having lost their intellectual baggage broke into the abyss with the shakes of political perturbations; the self-accepted “losers” who hid behind the church’s fence. Blue Noses became the speakers of the largest part of Russian society, of its nucleus made up of common men. Russian and Soviet culture never sympathized with the masses from this social level. Both the most officious and the most non-conformist of the artists kept a common man at a distance and talked about him with contempt. During the times of Perestroika this part of society was contemptuously named “the aggressively quiet majority”. Yet, this was the part of the society with which Blue Noses decided to associate themselves. They became the voice of this social class and expressed its point of view on reality. “Reality” for the common man means mainly his TV, the messages coming from which he accepts with uncritical faith. At the same time, due to the “political immaturity” inherent in the common man and his lack of clear opinions he wants not so much to evaluate the information he receives from the screen as to retell it in his own language of household clownery, to measure it up by the means of domestic anecdotes. The works of Blue Noses demonstrate the principle of humoristic commentary that the common man gives his TV. This is a performance for the sake of fun, a parody made purely for the reason of playing. Everything shown on TV at the time has its use – the figures of historical mythology, pop and cinema stars, active and retired political leaders or spiritual and moral authorities of the nation. Nothing is sacred! In total unison with the common man, Blue Noses are laughing at humanity, reducing its many activities to the bare functions of consumption, copulation and defecation. A series of objects by Blue Noses produced by Swarovski is a kind of test for the audience. Would you be able to keep your reason and relativism, can you laugh at your own relics and are not afraid to chuckle over the relics of other nations? For these objects are not tourist souvenirs, but altars of various faiths, albeit in miniature form. Each of those precious reliquaries contains a matching cult hero - Lenin, Stalin, the mummy of Pharaoh, souls of the righteous Islamists and so on. When you look inside the altar, instead of the devotional picture you see an idiotic scene featuring this respected character and reminiscent of the obscene joke. You don’t like it, you are outraged: “This is tactless, this is politically incorrect, it offends the supporters...”? Stop right here, now everything is clear about you! Your host politely extends a hand in farewell, but you can know for sure that you won’t be asked again. For the test have revealed a laugh deficiency syndrome and you are now a carrier and a potential victim of ideological disease. But if you start laughing contagiously, clap your hands and with sincere passion are prepared to watch the video again and again - then you are still a sane person with a healthy view of the world. And to this sane, common view of the world are dedicated the non-canonical altars of Blue Noses." Text: Andrej Erofeev (abstract). We can send you the whole text on request.